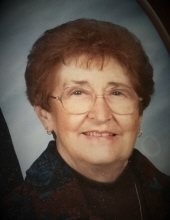 Genevieve “Lois” Shaffer, 89, of Metamora (formerly of Port Sanilac and Southgate), died Tuesday, March 26, 2019. Lois was born April 14, 1929 in Detroit to William Jr. and Genevieve Leverenz. Lois graduated 3rd in her class at Melvondale High School, class of 1947. She married Leonard Alfred “Len” Shaffer on September 11, 1954 in Belleville, Michigan. Lois was an office administrator for DTE Energy in multiple locations and Union Camp in Lapeer – she retired in 1992 after 28 years of service. Lois was a member of Immaculate Conception Church since 1969. She was a charter member of the Lapeer County Community Foundation – Women’s Fund. She was active with the Assistance League of Southeastern Michigan as well as the Friends of Lapeer Marguerite DeAngeli Library. She loved arts & crafts, painting and spending time with her family. Mrs. Shaffer is survived by her sons: Kevin (Cheryl) Shaffer of Columbiaville; Kirk Shaffer of Attica, grandchildren: Michael (Denise) Shaffer; Patrick (Ashleigh) Shaffer, great-grandchildren: Emma, Jack, and Charleigh. Lois was preceded in death by her husband, Len Shaffer and her parents: William and Elizabeth (Agge) Leverenz. Lois’ visitation will be 4-8PM Friday, March 29, 2019 at Muir Brothers Funeral Home, Lapeer. Her funeral Mass will be 11:00 AM Saturday, March 30, 2019 at the St. Louise Chapel of Immaculate Conception Church. Father Brian Hurley will be the celebrant. Lois’ family will receive friends from 10-11AM at the church the morning of the service. Burial will follow in Green Corners Cemetery. Memorial contributions may be made to the Lapeer County Community Foundation – Women’s Fund, 235 West Nepessing Street, Lapeer, Michigan 48446. "Email Address" would like to share the life celebration of Genevieve "Lois" Shaffer. Click on the "link" to go to share a favorite memory or leave a condolence message for the family.